Welcome! The lobby of the Deranged L.A. Crimes theater is open. Grab a bucket of popcorn, some Milk Duds and a Coke and find a seat. 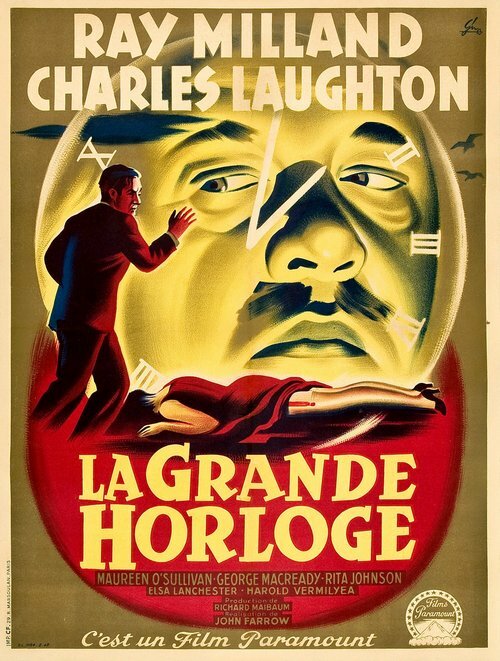 Tonight’s feature is THE BIG CLOCK (1948). 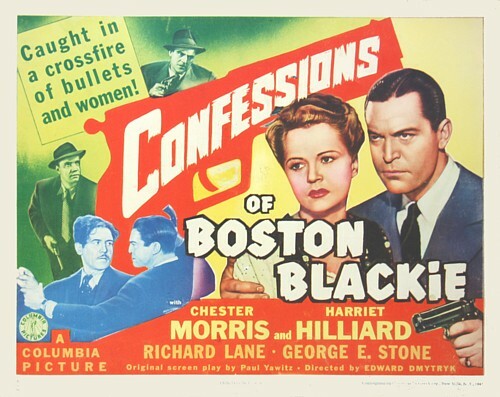 Directed by John Farrow and starring Ray Milland, Charles Laughton and Maureen O’Sullivan — this is one of my favorites. Enjoy the film! As George Stroud, editor-in-chief of Crimeways magazine, hides from security guards in the clock tower of the Janoth Publications building in New York City, he reflects on the fact that thirty-six hours before, he was leading a normal life as a Janoth employee: George, who is finally about to go on his honeymoon after seven years of marriage, is ordered by his tyrannical boss, Earl Janoth, to go on assignment or be fired. Fed up with being loyal to a firm that is jeopardizing his family life, George quits. He then joins Janoth’s mistress, Pauline York, in a bar and misses his honeymoon train while drowning his sorrows. Pauline, also tired of Janoth’s egocentric manipulations, offers to help George humiliate Janoth by writing a torrid biography of him. 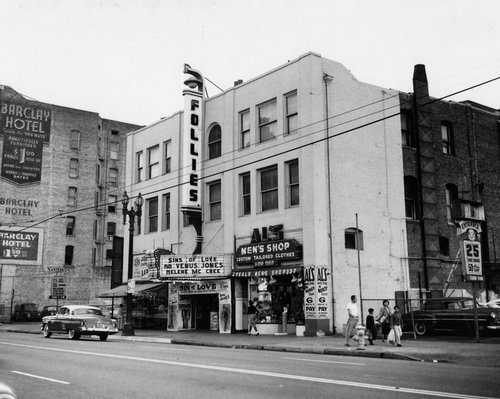 As the days, months and years ticked by the Black Dahlia case grew as cold as an Arctic blast. 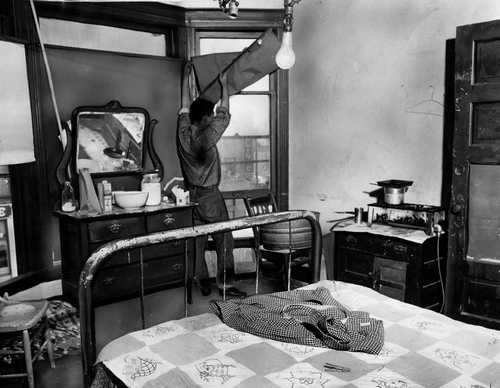 In late October 1949 the cops received an anonymous telephone tip that a woman had been murdered in a downtown hotel, and that her killer was the same person who had murdered Elizabeth Short. LAPD investigators rolled to the scene and what they found was sad, but it wasn’t murder. Upon examining her body Dr. Frederick Newbarr, county autopsy surgeon, determined that the woman had been badly beaten but that the beating had not been fatal. She’d been done in by a serious liver ailment caused by her heavy drinking. Detectives searched the dead woman’s handbag and they found an ID card and other papers that revealed her to have been Mrs. Lucille Bowen, a former dancer in a Main Street burlesque house. Also in Lucille’s handbag were a couple of police business cards; one of them belonged to Officer C.O. Smith and on its back was written “Lucille Bowen, a good friend of mine. Any courtesy extended to her will be appreciated.” A second card belonged to Officer R.E. Myers, it was apparently signed by him and had a similar inscription. The cards were issued during the time that Smith was on the Central Division Vice Squad and Myers was assigned to administrative vice. By October 1949 Officer Smith had moved up the chain of command and was in charge of the vice unit at LAPD’s University Division. When quizzed by reporters Smith stated that he didn’t recall Lucille and he doubted the card was his. Myers had made detective, however reporters couldn’t reach him for comment. The two cops may not have recalled Lucille, but personally I have little doubt that the cards belonged to them, particularly since they’d worked vice. The business cards were probably never intended for use as “courtesy cards”; and I think it is likely that Lucille came into possession of the cards and then simply wrote on the backs of them. Lucille may have considered the cards to be talismans that could protect her from arrest, but if that’s what she believed she had been misinformed. Courtesy cards weren’t equivalent to a Monopoly “Get Out of Jail Free” card and wouldn’t have been much use to her. According to the hotel room clerk Ralph Myers (as far as I know he was no relation to the cop) Lucille had registered for a room the night before with an unidentified man — they’d signed in as Mr. and Mrs. James Johnson. Police records revealed that years prior to her pitiful death Lucille had come to L.A. as Rena Lucille Hodge, a strikingly beautiful dancer from Oklahoma City with big Hollywood dreams. 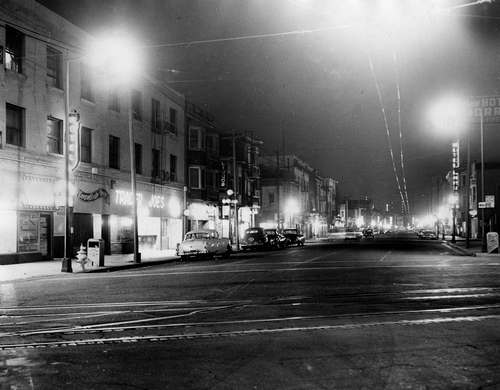 Like so many girls before her Lucille’s dreams had died hard, crushed in the crucible of Main Street burlesque joints. In December 1944 she was busted on Main Street with nine others on charges of contributing to the delinquency of minors by staging a lewd show. By the time her body was discovered in a Skid Row hotel Lucille had been reduced to life on “The Nickel” (Fifth Street) chasing her dreams with enough liquor to destroy her liver. 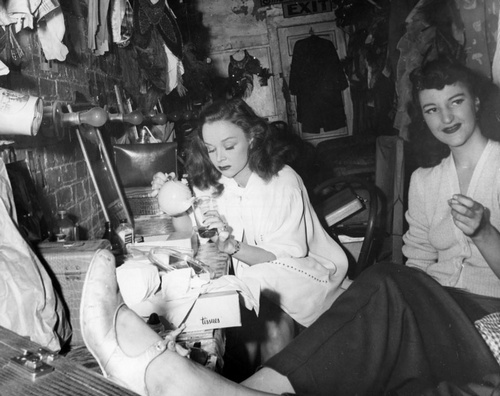 It would have been easy for her to find male companionship in the dark bars along Skid Row — men who might listen to her stories of a movie career that never materialized for a few minutes before they would beat and use her. 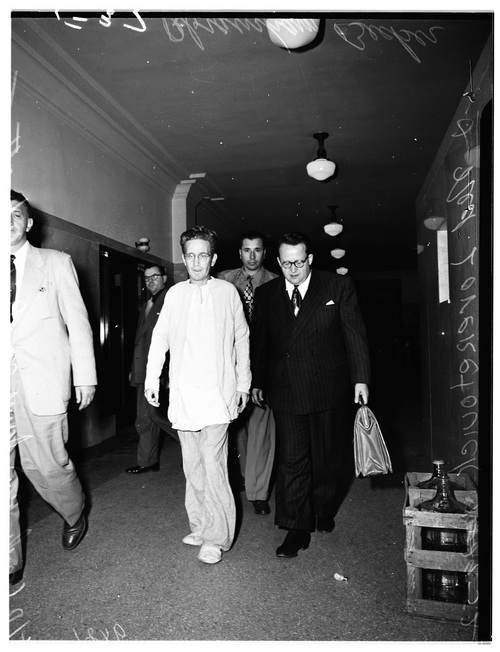 Lucille’s death had not provided LAPD detectives with a much needed lead in the Black Dahlia case. In the nearly three years since Short’s murder a solution to the crime was still out of reach. Welcome! The lobby of the Deranged L.A. Crimes theater is open. Grab a bucket of popcorn, some Milk Duds and a Coke and find a seat. Tonight’s feature is TIMETABLE (1956). Mark Stevens both starred in and directed the movie. The film also starred King Calder, Felicia Farr and Marianne Stewart. A physician, whose license has been revoked, poses as a practicing doctor aboard a train passing through Arizona. His presence there is part of a caper involving a fictitious patient, on whose behalf he gains access to his checked baggage, including his physician’s “black bag,” in the baggage car, whereupon he blows and then robs the safe. 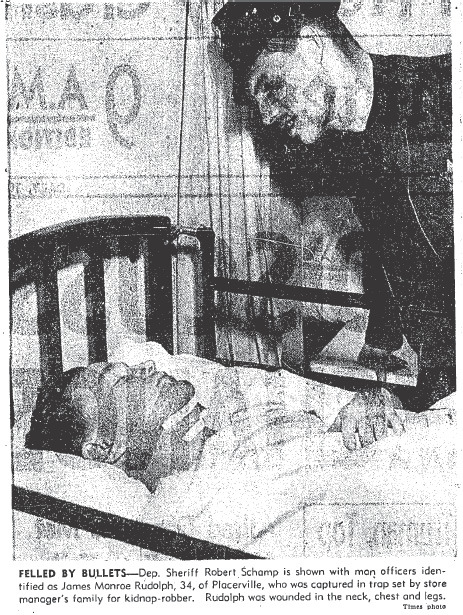 Then he arranges for both the fictitious patient, which he claims is infected with a communicable disease which poses an immediate and extremely serious public health risk, and himself to leave the train, presumably departing for the closest hospital, which is also far from any scheduled train stop, the two thereby escaping with $500,000 in an ambulance. The railroad officials do not discover the robbery until the train reaches Phoenix, many hours after their escape has been effected. Welcome! The lobby of the Deranged L.A. Crime theater is open! Grab a bucket of popcorn, some Milk Duds and a Coke and find a seat. 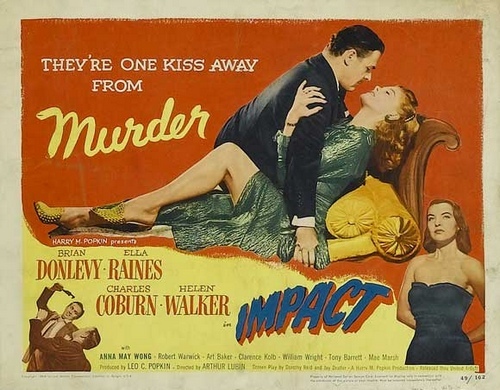 Tonight’s feature is IMPACT directed by Arthur Lubin and starring Brian Donlevy and Ella Raines. 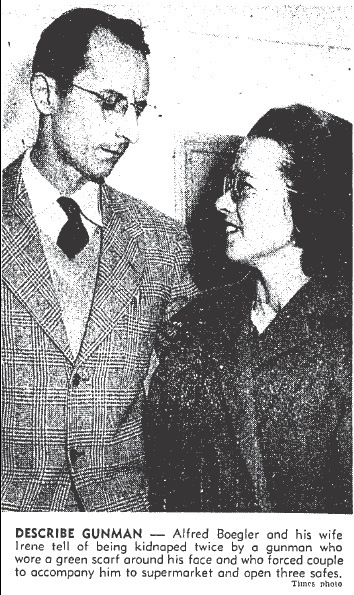 After delivering a passionate speech in which he convinces his company’s board of directors to purchase some factories in Tahoe, California, San Francisco industrialist Walter Williams returns home to his wife Irene. Walter reenacts part of the speech for Irene, and their maid, Su Lin [Anna May Wong], mistakes it for an argument. Walter then leaves to finalize the deal, promising to call Irene on his way home. After Walter leaves, Irene phones her lover, Jim Torrence, with whom she is plotting to kill Walter, and tells him to go to Sausalito. When Walter phones Irene, she persuades him to give her cousin “Jim,” who is stranded in Sausalito, a ride to his home in Denver. Walter meets Torrence and they drive for several hours before stopping at a café. While Walter is inside, Torrence sabotages one of Walter’s tires. When the later tire blows, they stop near a steep embankment. Torrence then hits Walter on the head with a wrench, rolls his unconscious body down the slope and tosses his briefcase after him. Welcome! The lobby of the Deranged L.A. Crime theater is open! Grab a bucket of popcorn, some Milk Duds and a Coke and find a seat. 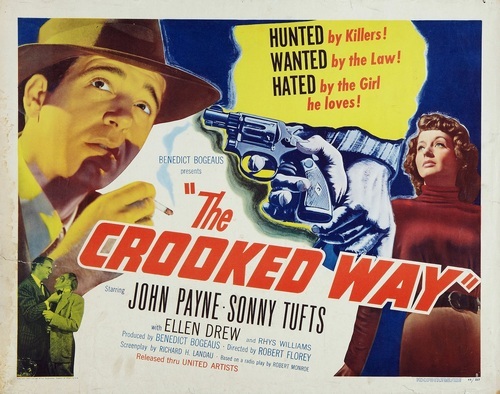 Tonight’s feature is THE CROOKED WAY directed by Robert Florey and starring John Payne, Sonny Tufts and Ellen Drew. THE CROOKED WAY has all the elements of a solid film noir: flashing neon signs, shadows on a wall, guys in suits, hats, killer ties and a dame with a grudge. Bonus points for some nice shots of post-war L.A.
Eddie Rice, a veteran suffering from amnesia, returns to Los Angeles from a San Francisco veterans hospital hoping to learn who he is and discovers that he is a gangster named Eddie Riccardi and has a police record. Although he does not know it, five years earlier, Eddie was acquitted of murder after turning state’s evidence for homicide detective Lieutenant Joe Williams. His partner, Vince Alexander, took the “rap” and spent two years in prison. On a Los Angeles street, a woman recognizes Eddie and reports him to Vince, who sends his thugs to beat up Eddie. Holding an old newspaper clipping announcing the verdict that put him in jail, Vince confronts Eddie about the past and gives him one day to leave town.